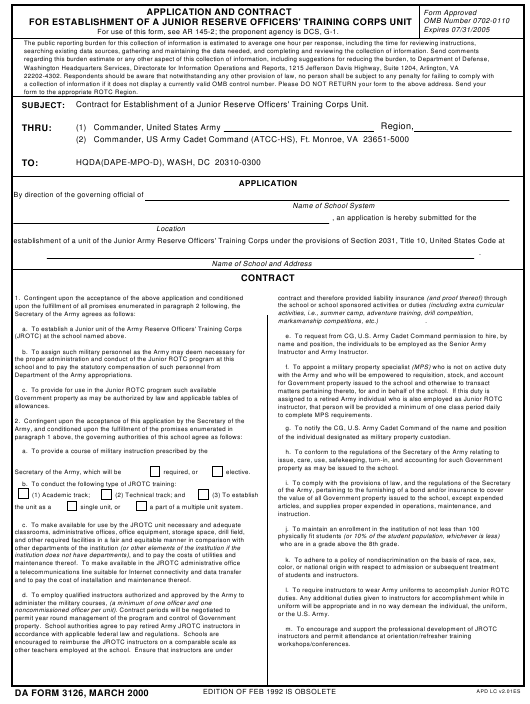 DA Form 3126 or the "Application And Contract For Establishment Of A Junior Reserve Officers' Training Corps Unit (s&i, Hqda, Attn: Tapc-opp-p, 200 Stovall St., Alexandria, Va 22332-0418)" is a Department of the Army-issued form used by and within the United States Military. The form - often incorrectly referred to as the DD form 3126 - was last revised on March 1, 2000. Download an up-to-date fillable DA Form 3126 down below in PDF-format or look it up on the Army Publishing Directorate website. Contract for Establishment of a Junior Reserve Officers' Training Corps Unit. (JROTC) at the school named above. Department of the Army appropriations. of the individual designated as military property custodian. and to pay the cost of installation and maintenance thereof. appraisal forms provided by the Army. conduct of the Junior Reserve Officers' Training Corps. establishment of a Junior ROTC unit on the date specified. of the Army and the school pertaining to this matter.